The following review contains spoilers, so if you’re looking for a surprise in the book, please read this after you finish! Thanks! I first came onto Dragonsong after I had read The Dragonriders of Pern trilogy (which sets up the entire series of Pern books). I read the trilogy in a gulp, as the world of Pern and the life of the Weyr totally fascinated me. I immediately went looking for anything more about Pern and I encountered Dragonsong. Menolly was a minor supporting character in the third volume of the Dragonriders trilogy, The White Dragon, and I was surprised to find a complete novel built around the character, but I jumped in with no preconceptions. Menolly is the youngest daughter of Yanus, Holder of Half-Circle Sea Hold on the wild Eastern part of the northern continent on Pern and she is 15 years old at the beginning of the novel. Petiron, the Hold Harper, had found her to have an exceptional musical talent when she was very young. Even though girls were not allowed to be Harpers, he taught her how to play all of the instruments, to sing the traditional songs and eventually to write music. He even sent some of her music to Robinton, the Masterharper of Pern, for evaluation. The novel begins with Petiron’s death and the subsequent abuse of Menolly by her family, who believe a musical daughter is disgraceful. Her father forbids her to write music and even beats her when she disobeys. When the replacement Harper arrives, Menolly is hidden from him, even though he is seeking the composer of the wonderful music sent to the Masterharper. After she badly cuts her hand, her mother intentionally mistreats the wound so that Menolly believes she will never play music again. Menolly falls into a deep depression. Caught out during threadfall and stuck in a cave, Menolly witnesses the hatching of wild fire-lizards (miniature dragons). To prevent them from dying, she feeds the small creatures and bonds (or imprints with) nine of them, who will then be her friends for life, linked telepathically. Deciding that she will not return to the hold, Menolly makes a life for herself on the coast, living in the fire-lizard cave, spending most of her time just finding food for the ravenous creatures. She makes herself a set of pipes and the fire-lizards learn to sing with her. During a later threadfall, she is caught away from the cave and must run for cover in her worn boots, tearing her feet to ribbons in the process. Fortunately, she is rescued by a dragonrider, who brings her to Benden Weyr. For the first time in her life, Menolly begins to understand what it is like to be treated with respect and affection. Her nurse is Mirrim, one of the most enigmatic characters throughout the saga. They are about the same age and quickly become friends. Afraid that she will be sent home, Menolly hides her fire-lizards until she is found out by Weyrwoman Lessa. Breaking down, she begs not to be returned home and is asked to stay in the weyr. Once accepted, she becomes overwhelmed by all of the attention. It is at this point that events from the novel Dragonquest become interwoven into Dragonsong, most notably, Brekke’s recovery from the death of her dragon and Jaxom’s impression of the little white dragon, Ruth. For those familiar with the earlier novel, it is really great to see the same events from a very different point of view. The book ends with Masterharper Robinton’s discovery of Menolly as the composer of the songs that Petiron had sent him. Overjoyed, he asks her join the Harper Hall. At last, she will be able to pursue her love of music and to begin her new life as a musician. McCaffrey tells the story of a hero overcoming adversity extremely well. It is completely believable that Menolly suffers unbearably in order to pursue her dream. Her suffering is even more poignant in that it is at the hands of her own family, those who should love and support her. McCaffrey takes the time to detail these familial characters, so that they do not feel two-dimensional and so that their mistreatment of Menolly is understandable, if not agreeable. Menolly’s love of music is treated in such a way that the reader develops an amazing sympathy for her plight. Everyone should have such a love of something that it would be the whole purpose of his or her life. This is a terrific foundation for the rest of the novel and also for the sequel, Dragonsinger. When she realizes that she has left her hold for good, there is a miraculous sense of freedom, which is punctuated by the miracle of the fire-lizard hatching. Menolly literally saves their lives, as she has saved her own, and both she and her fire lizards may live free. This freedom is referenced again several times in Dragonsinger when, under the pressures of life in the Harper Hall, she remembers the complete freedom of living in the cave. After her rescue, Menolly can scarcely believe her luck – she almost always worries that what she is doing is wrong or that someone will come down on her for her actions. This is the result of her mistreatment at the hands of her family. She has been conditioned into believing that she is always in the wrong. Part of the poignancy of the story is that the weyrfolk and harpers have to convince her of her own worth. And when she realizes that she can both play and write music to her heart’s content and to the joy of others, she feels an amazement and gratitude that the reader can share in completely. It is cathartic. 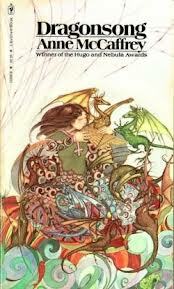 For me, Dragonsong is a perfect little novel.